NORTH CAROLINA 12, Dartmouth (Big Green, 4,196 students, Hanover, NH) 7 – Jimmy Dunster scored a career-high four goals and Steven Rastivo made 12 saves in his first career start to lead sixth-ranked North Carolina to a 12-7 victory over Dartmouth in men's lacrosse at Fetzer Field. The Tar Heels played from behind much of the game before Dunster helped lead a 7-1 Carolina scoring run over the last 17:38 to pull away for the victory. NORTH CAROLINA 11, MARYLAND 6 – North Carolina's sixth-ranked men's lacrosse team got seven goals and seven assists from freshman and Steven Rastivo made a career-high 13 saves to power the Tar Heels to a 11-6 come-from-behind victory over fifth-ranked Maryland at Capital One Field at Byrd Stadium. The victory was the first for the Tar Heels in College Park since 2003 and only the second win for UNC at Maryland since 1993. The Tar Heels improved to 7-2 overall and 1-1 in the ACC before a crowd of 3,176 fans and a national television audience on ESPNU. Maryland saw its four-game winning streak end as the Terps fell to 6-2 overall and 0-2 in the ACC. DUKE 14, Georgetown (Hoyas, 15, 318 students, Washington, DC) 12 –The Duke University men's lacrosse team outscored visiting Georgetown 9-3 in the second half to post a 14-12 come-from-behind victory over the Hoyas in men's lacrosse action at Koskinen Stadium. 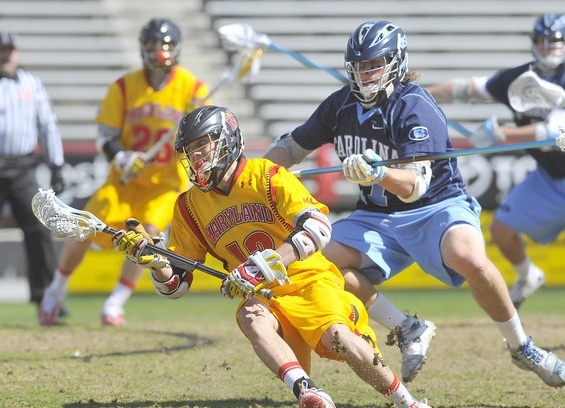 Freshman attackman Jordan Wolf led the No. 4 Blue Devils with a career-high seven points from four goals and three assists. 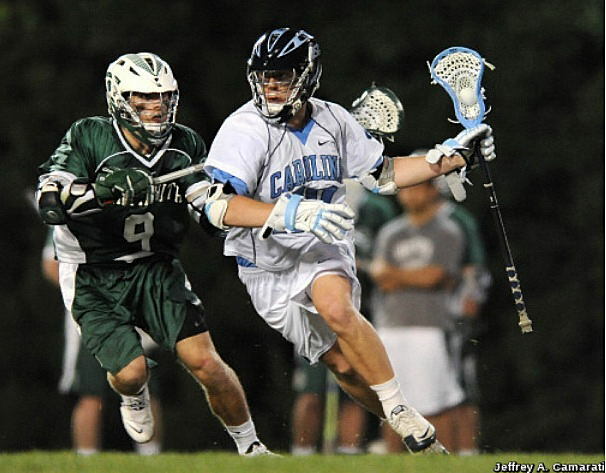 Johns Hopkins (Blue Jays, 4,744 students, Baltimore, MD) 12, VIRGINIA 11 – Steele Stanwick had three goals and four assists for the No. 2 Virginia Cavaliers (7-2), but it wasn't enough as the No. 11 Johns Hopkins Blue Jays (6-2) broke a six-game losing streak to UVa with a 12-11 triumph on Saturday at Homewood Field. Johns Hopkins captured the Doyle Smith Cup for the first time in the trophy's six-year existence. Starting with the 2006 season, the regular season winner of the Virginia and Johns Hopkins matchup gets to keep the cup. DUKE 12, Brown (Brown Bears, 6,316 students, Providence, RI) 7 – Five different Blue Devils registered a multiple-point game to lead third-ranked Duke University to a 12-7 non-conference victory over Brown at Koskinen Stadium. Eleven players notched at least one point in the game for the Blue Devils as Duke had eight different goal scorers. Duke (8-2) pushes its win streak to seven games and its home win streak to 14. 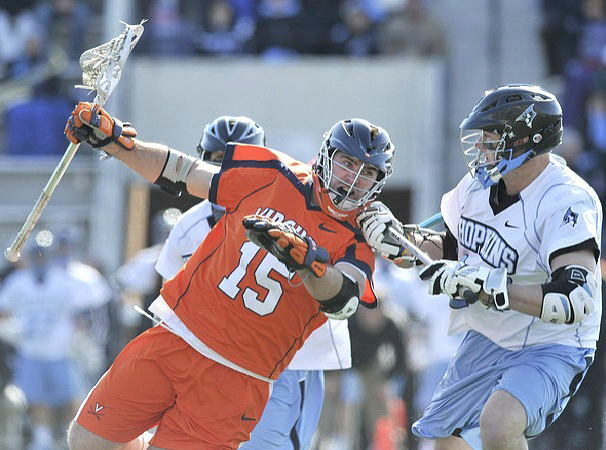 The 14-game run at home currently is the longest active streak in Division I lacrosse. Senior Zach Howell and freshman Jordan Wolf both contributed three points from two goals and an assist, while junior Robert Rotanz and Christian Walsh also chipped in two-goal efforts. Sophomore defenseman Bill Conners registered his first career goal as well.